"Service Oriented Architecture for The Composable Digital Business"
Service Orientation is evolving with the times to support today’s increasingly distributed IT environment. David provides his perspective on the state of Enterprise IT and the struggle to keep up with the demands for interoperability and agility to support Cloud, Internet-of-Things and Blockchain applications. David outlines nine "Disruption Vectors" he identified as key in the transition to the Software-defined business. David then reveals how he scored EnterpriseWeb relative to industry for each vector. Read this paper to learn how to radically simplifies distributed computing, and design, run and manage Cloud-Native applications and Web-scale business processes that dynamically integrate operations and connect value chains. 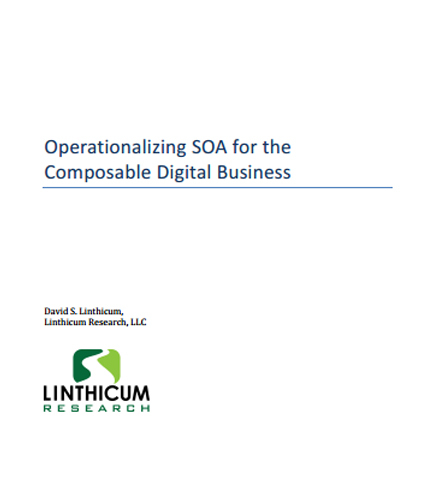 Download the latest whitepaper from globally renowned Cloud expert David Linthicum "Operationalizing SOA for the Composable Digital Business". This case management whitepaper helps you in the examination of the role of Case Management platforms for application development. As the traditional packaged software fails too often to address the unique requirements of knowledge work, which is complex in nature and subject to frequent changes in definition, the organizations have started leveraging a case management platform for agile applications. Download this whitepaper which addresses the case-centric processes better than integration-centric BPM technologies that have been retrofitted via Case Management Frameworks (CMFs). It highlights the following points: Benefits of adopting Case Management Platform leverage Case Management Platform to support mission critical applications Comparison between BPM and Case Management Automate mandatory and discretionary tasks with adaptive case management.